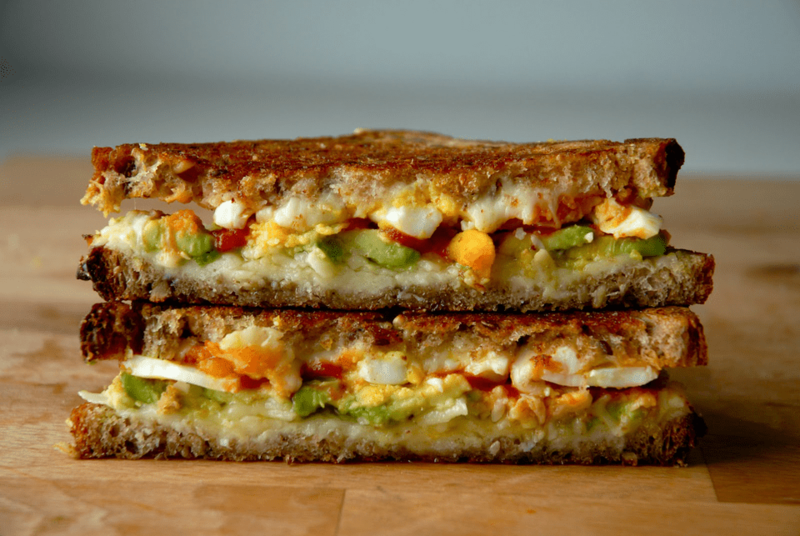 This savory breakfast grilled cheese pairs nutty gouda with creamy avocado, a perfectly cooked medium boiled egg, and some spicy Sriracha hot sauce all grilled between two buttery slices of wholegrain bread. And best of all - this breakfast sandwich is perfect to eat on the run! Before you begin, you'll want to have a perfectly cooked medium boiled egg. If you have no idea how to do that, no sweat - it's easy! Just place 1 egg in boiling water, lower the heat to medium, and then cook for 8 minutes. Shock the egg in ice water and then peel immediately. The yolk will be just slightly runny in the middle while the outside is firm to the touch. Now that your egg is prepared, layer 1 piece of bread with half of the gouda cheese, the entire sliced avocado, the entire crumbled egg, a drizzle of Sriracha, the remaining cheese and then the other piece of bread. Butter both sides of the sandwich and set aside. In a cast iron skillet or panini press, place buttered sandwich in and cook until the exterior is crispy and golden and the interior is melty and irresistable. Allow to sit for a few minutes to firm up and then serve. Don't forget to share!